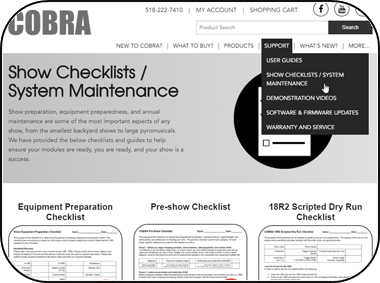 Check back often to stay informed of the latest COBRA website and product updates. We will be updating this page with new products and stock availability information. 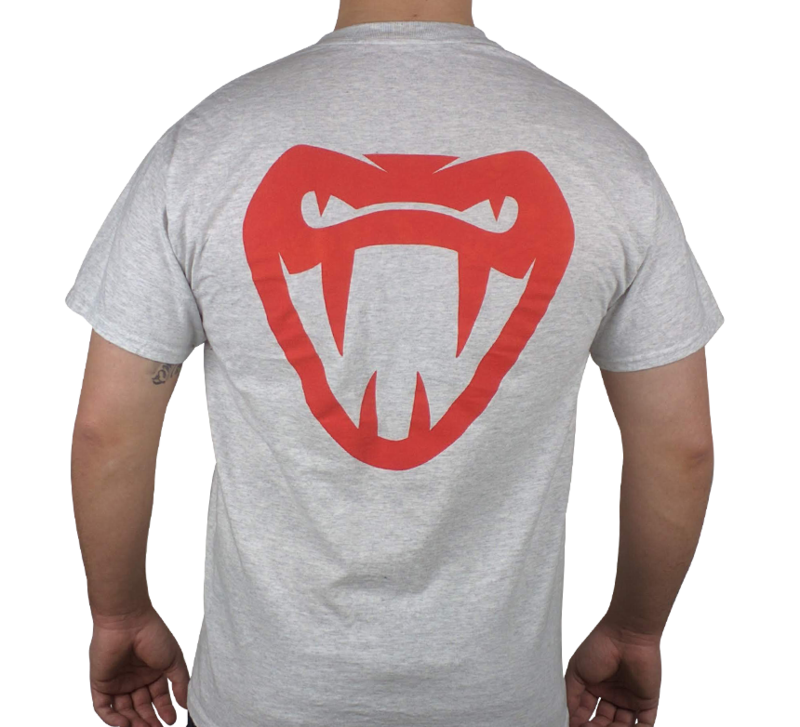 Grey COBRA "Get Bit" Shirt Released! We have released a new grey "Get Bit" Shirt! This light colored shirt will keep you cooler in the summer, while still allowing you to show your COBRA pride! International Shipping Regions Added to Shipping & Availability Hub! We have updated our Shipping & Availability Hub to include information on international shipping regions. As we announced prior to our Black Friday sale, we are implementing some minor price adjustments for 2019. For the sake of transparency, we have put together a complete list of the items that are having price increases, and the amount of increase itself. These changes will start to go into effect on the first of January. 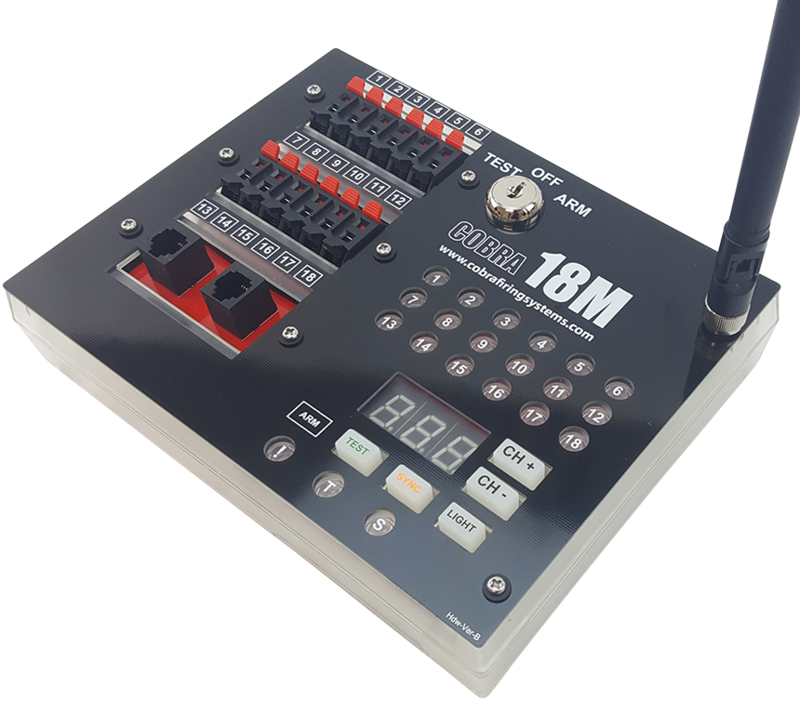 Along with these price adjustments we are also implementing permanent price reduction on our 18R2 Pro Remote. The new standard price for this product is $299.99. 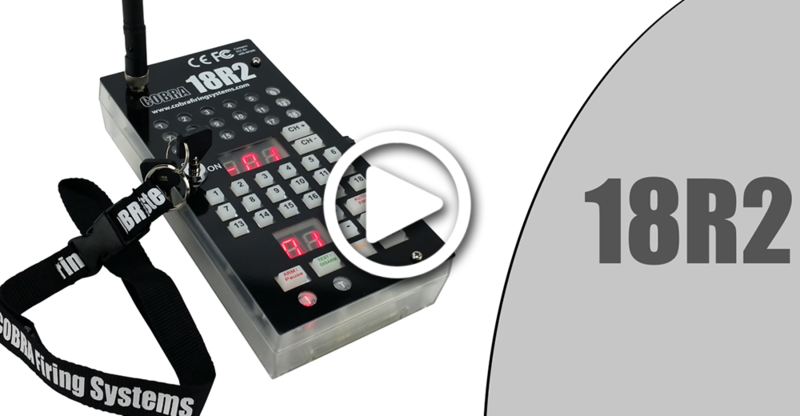 Along with this reduction, we are also discontinuing the 18R Basic Remote. 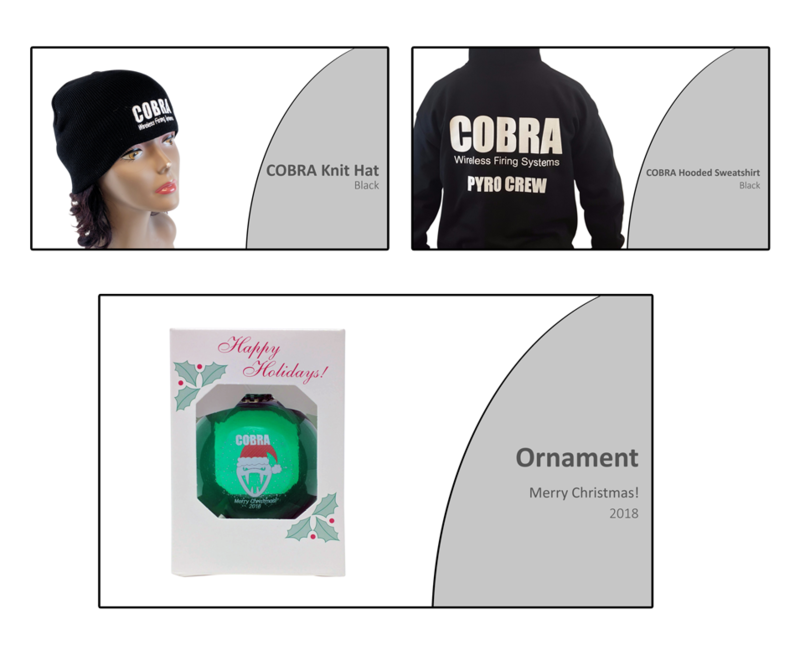 Just in time for winter, introducing the COBRA Winter Swag Package! We have assembled all of our cold weather items, including the brand new 2018 Christmas Ornament, into one bundle! For a limited time, this package has been marked down 40% to only $35.99. Fire Retardant Armored Case Cover for 18M! We have released a Fire Retardant cover for the 18M Armored Case. This cover is great for those that prefer armored cases, but would like additional fire protection. 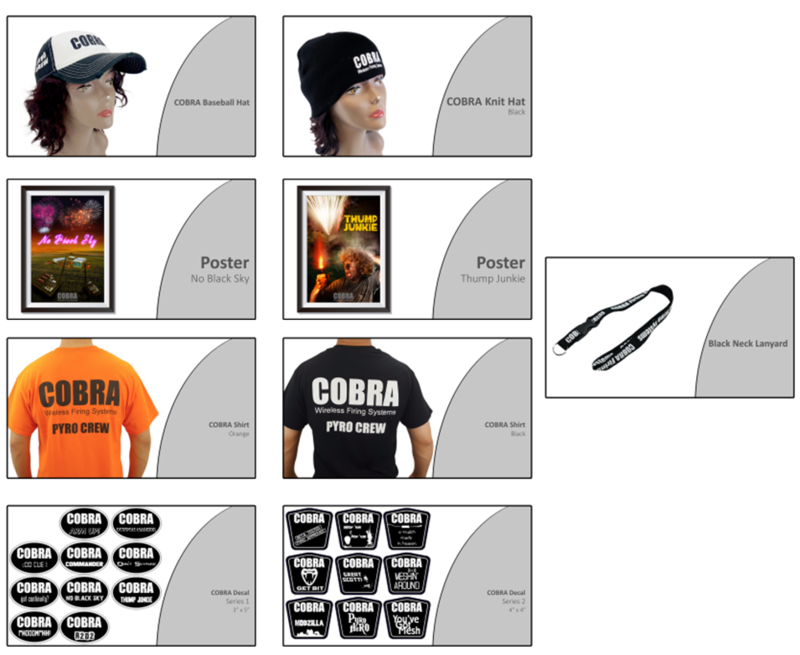 Introducing the COBRA Swag Package! We have assembled our best selling swag and apparel products into one large bundle. For a limited time, this package has been marked down 40% to only $44.99. COBRA Approved USB Drive Released! 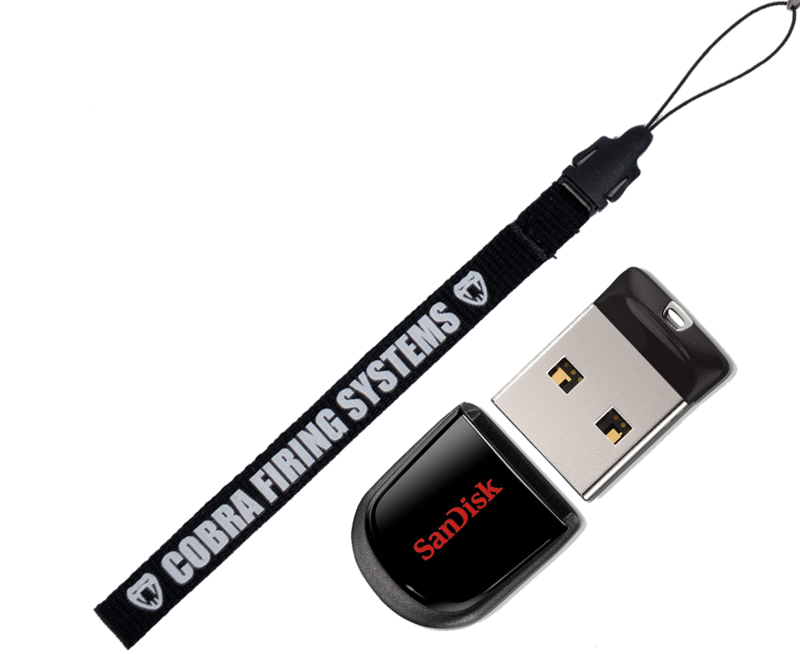 We are delighted to announce we have released a certified COBRA USB drive for use with COBRA equipment. In some cases, other USB drives may cause performance issues. We suggest only using this USB drive for optimal performance. We are incredibly excited to debut our newest product line, the 36S Slat! This is a 36 cue slat meant for situations where you want to utilize a large number of cues in a position. The slat connects via a Centronic 50 connector and is compatible with Pro-Adapt Plates that have one, including the Pro-Adapt Plate for 36M (2 x 18S, 1 x 36S), the 36M with Onboard Cues, and the 72M with Onboard Cues. The slat is available in a regular size, mini, as well as built in a side-exiting armored case. We are also launching several other products to support these including cables, covers, shunts, and adapters, and module packages that include 36S slats You can find a full list of the new products below. 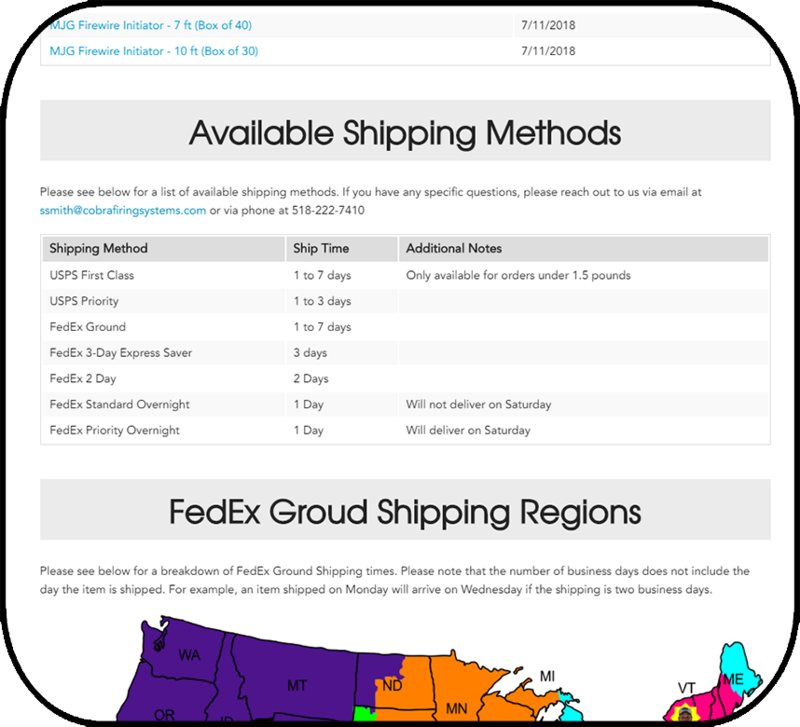 Shipping & Availability Hub Has Been Added! We discovered two minor issues in the current 5.0.2 BETA firmware for the 36M and 72M. 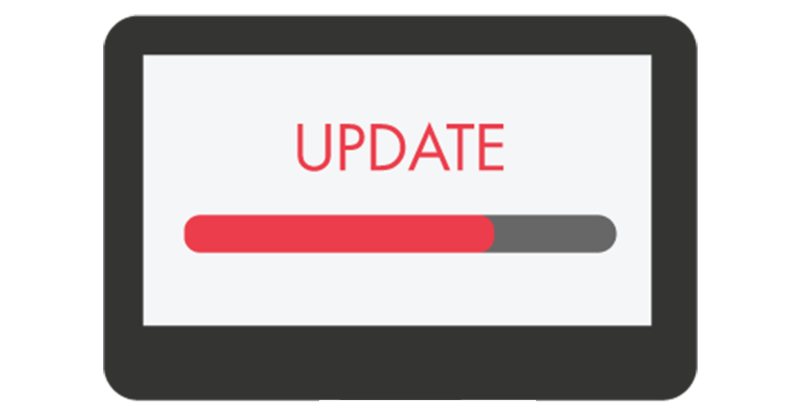 It is important that you update your current devices in order to avoid any issues. Please find an explanation of the issues below and how to update your devices. Please note that this issue is on the 36M and 72M only. Issue #1: The 36M and 72M may not show continuity if the internal temperature exceeds around 110°F or 43°C. For example, this can occur in ambient temperatures as low as 80°F or 27°C when the unit is exposed to direct sunlight for extended periods of time. Please note that even though the 36M and 72M would not show continuity, this would not prohibit the unit from firing. This firmware update will fix this issue. Issue #2: The 36M and 72M may not show continuity for certain Talon igniter clips due to having a higher resistance value. This has been resolved as continuity will now display for those Talons. This could occur in as high as 20% of Talons. This patch release will fix this issue. Insert the USB drive into your 36M or 72M. device is now running 5.0.3. If you have any questions, please contact us at ssmith@cobrafiringsystems.com. What's the Difference Between the 18R and 18R2? 18R2 and 18M Detailed Demonstration Released! Scott and Joel have been hard at work the last few weeks in our secret COBRA film studio producing the first video in a new series of detailed demonstration videos. 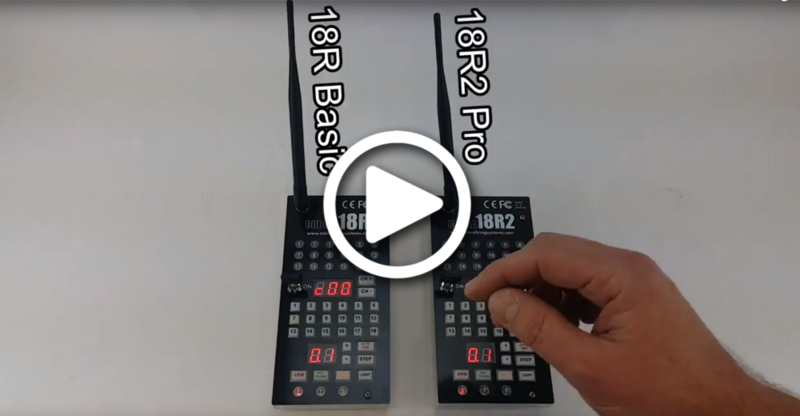 This first video is a deep dive into both the 18R2 and 18M. The video is broken down into chapters and timestamped as well, so check it out! 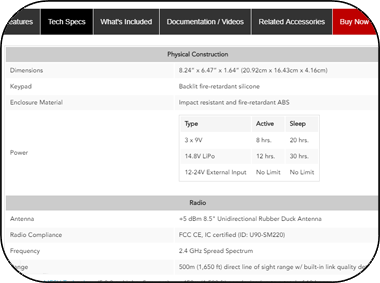 Tech Specs on Core Equipment Have Been Updated! The 72M Has Entered Pre-order Status! We have officially released the 72M Firing Module for May 14th Pre-Order! Just like the 36M, the 72M is capable of utilizing various Pro-Adapt plates to allow for different connection methods, but with twice as many cues! 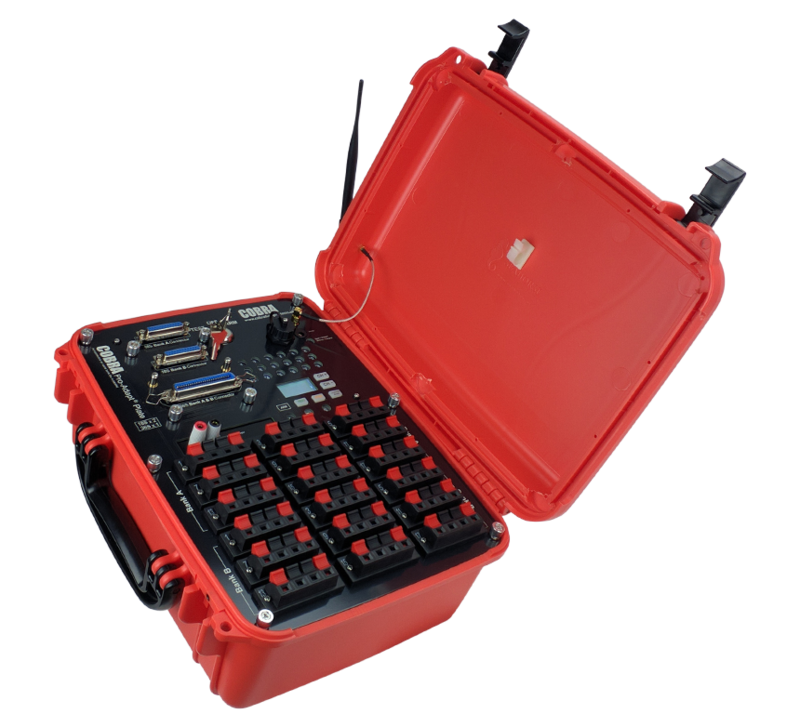 Initially, we will be offering the 72M in a large armored case with onboard speaker terminals, and a armored case that allows for 4 x side exiting DB25 connections. We will be continuing to roll out new ways to connect to the 36M and 72M in the coming two months. Other options will include a set of boots that allow for cables to run out the side, quick plug support, mini 6 cue slats including CAT-5 cable support, and more. Any 72M can use a different Pro-Adapt plate by simply removing the plate and plugging in another. The 72M comes with a standard LiPo, external power and still supports 9V batteries in a pinch. In addition, we have added an LCD screen for displaying channel, address, battery levels, signal and more without having to rely on a boot up process. We will be offering $75 off both 72M versions during our Spring Stock Up Sale on March 23rd. Drawings Have Been Added to All Lipo Chargers! 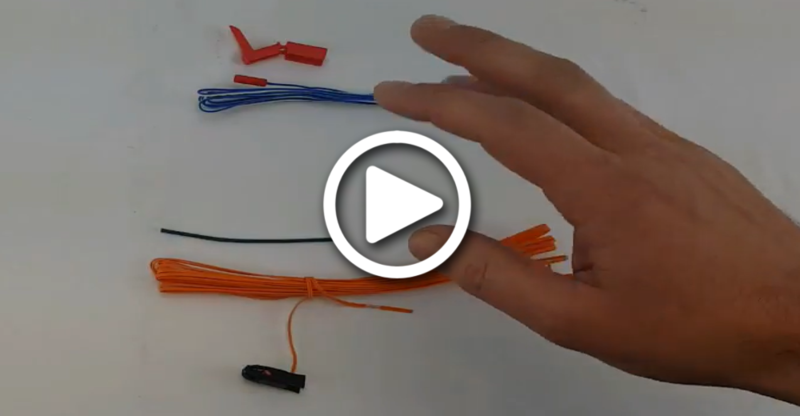 We have recently received a few inquiries about the exact length of our lipo chargers. To help with ease of information, we have added clarifying drawings to all of our lipo chargers. You can view these on our LiPo Chargers page. 36M with Onboard Cues Now Available in Orange Case! 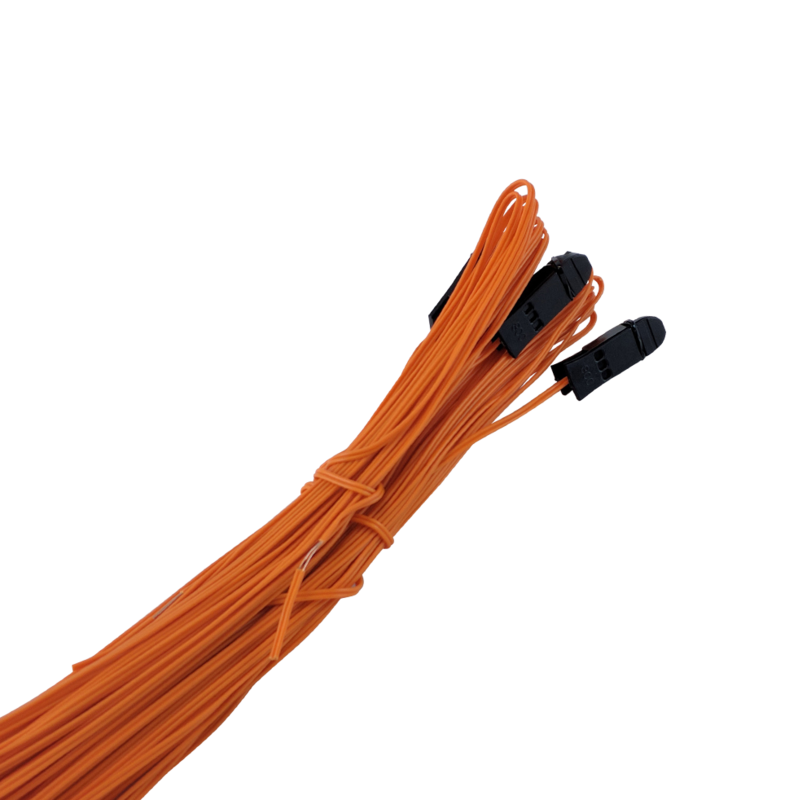 After receiving multiple requests, we are now happy to offer our 36M with Onboard Cues in an Orange Case! 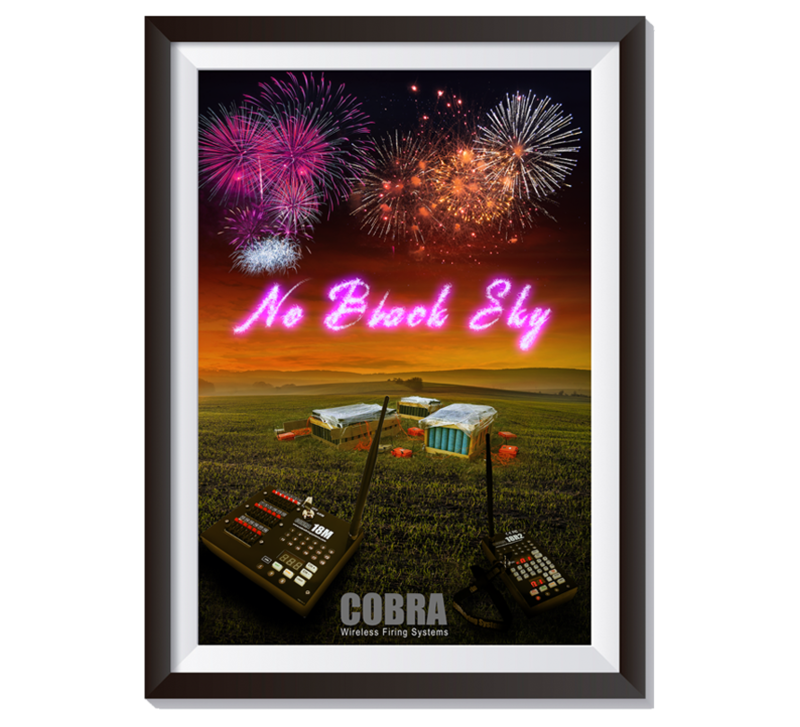 Today we are announcing the start of a line of COBRA Posters. 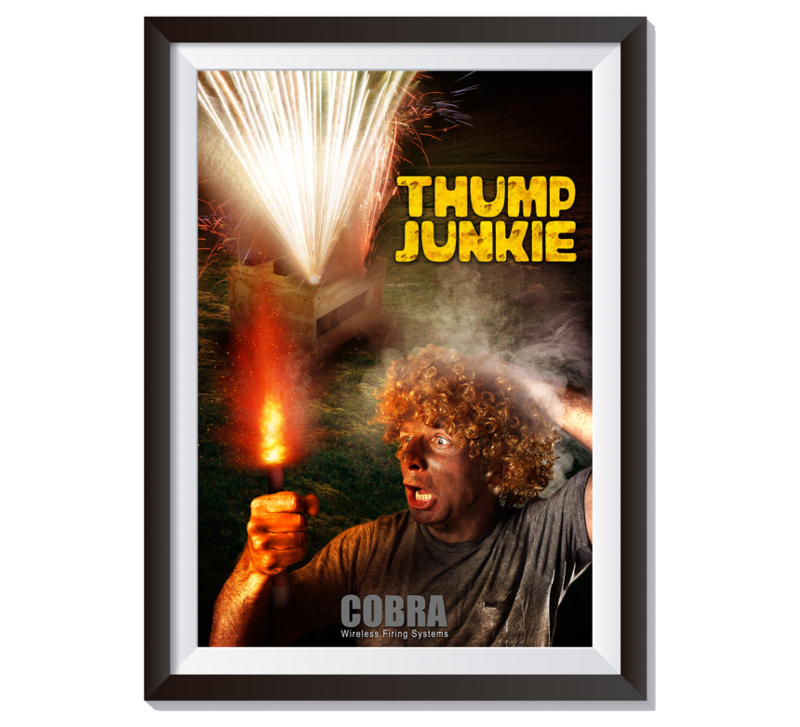 We currently have two different posters available, Thump Junkie & No Black Sky. Put them on your wall today! We are incredibly excited to offer a new unique product, a Remote Holster for the 18R and 18R2. 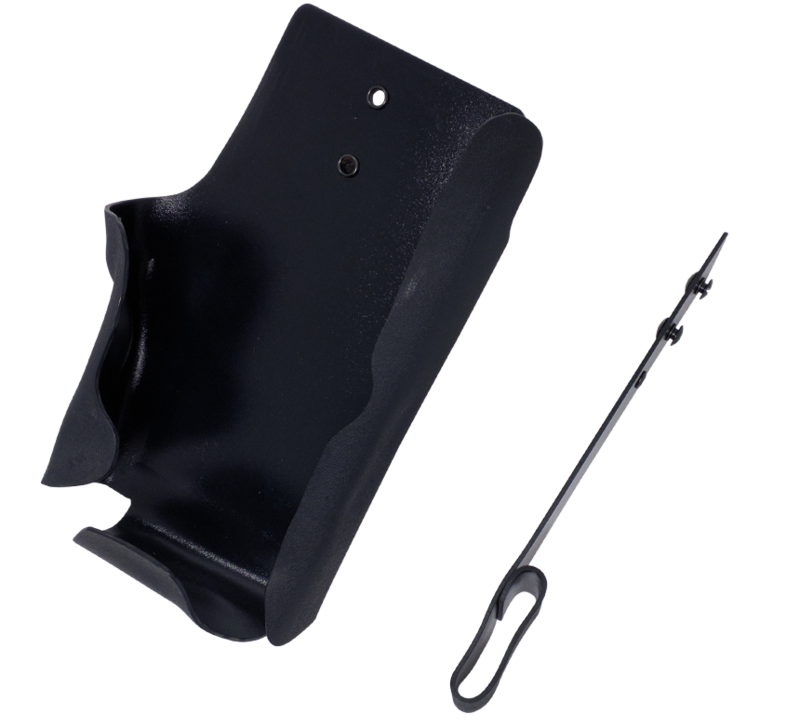 Keep your remote by your side at all times with this holster! It can attach to a belt, or be reversed to be supported from within your pocket. 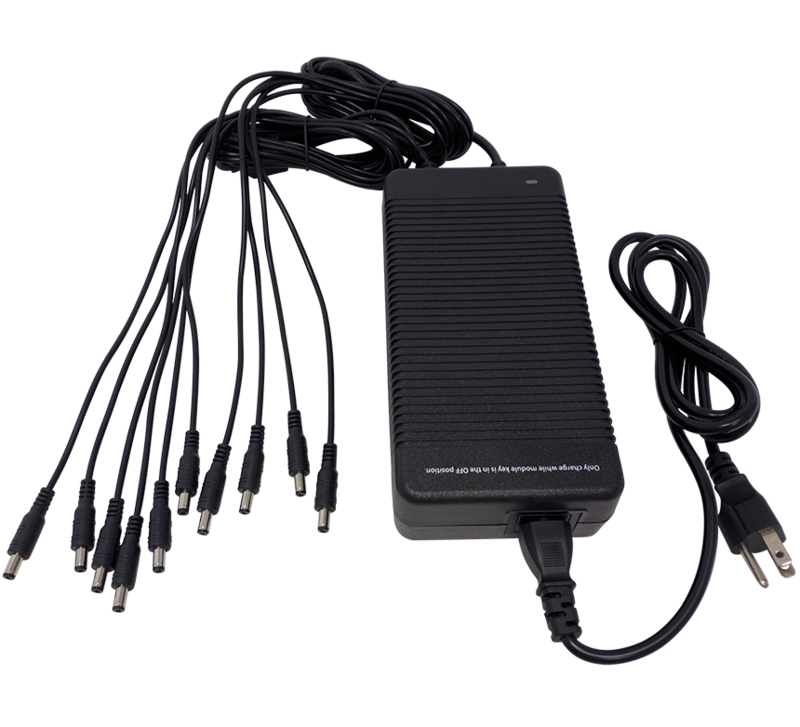 We have been getting many requests for chargers than can charge more than five modules at once, and we are happy to finally offer a 10 Module LiPo Charger. The charge rate will remain the same with ten simultaneous modules as with five. Test Bulbs, Module Box, and Audio Box Buttons Added! Show Checklists / System Maintenance Section Added! Make sure all equipment is properly prepared and checked before a show. Ensure that all equipment functionality is verified prior to shooting your show. Perform a dry run of a scripted show. Common troubleshooting issues per device. Provides instructions on the steps to take after any type of issue on your show. Issues can be caused by the operator, equipment, environment, or other factors. Best practices for annual maintenance of your COBRA equipment. 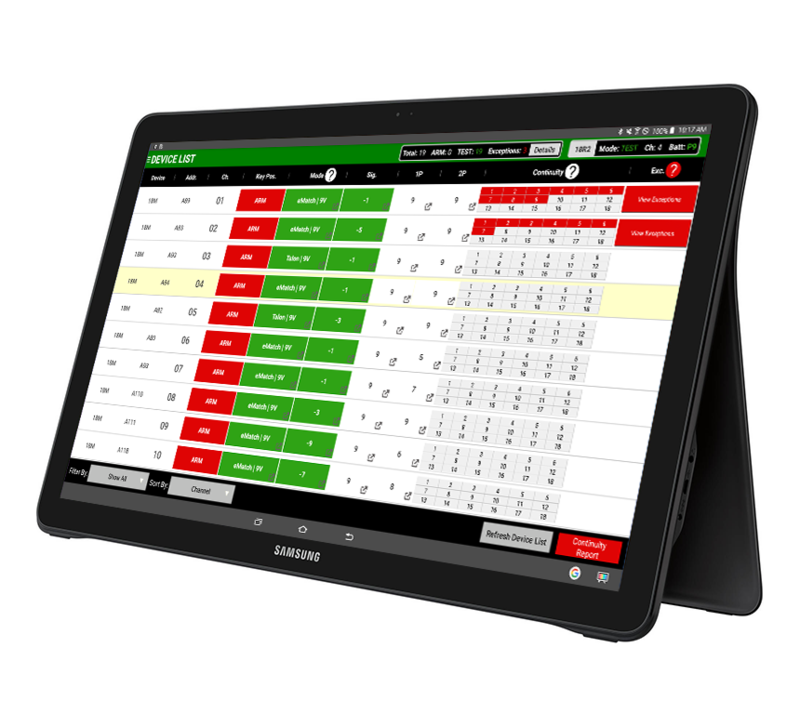 We are excited to announce that we have added a comprehensive list of tablet recommendations to our COBRA Control Panel product page. Be sure to check these out if you are in the market for a tablet and want some direction in choosing a device. 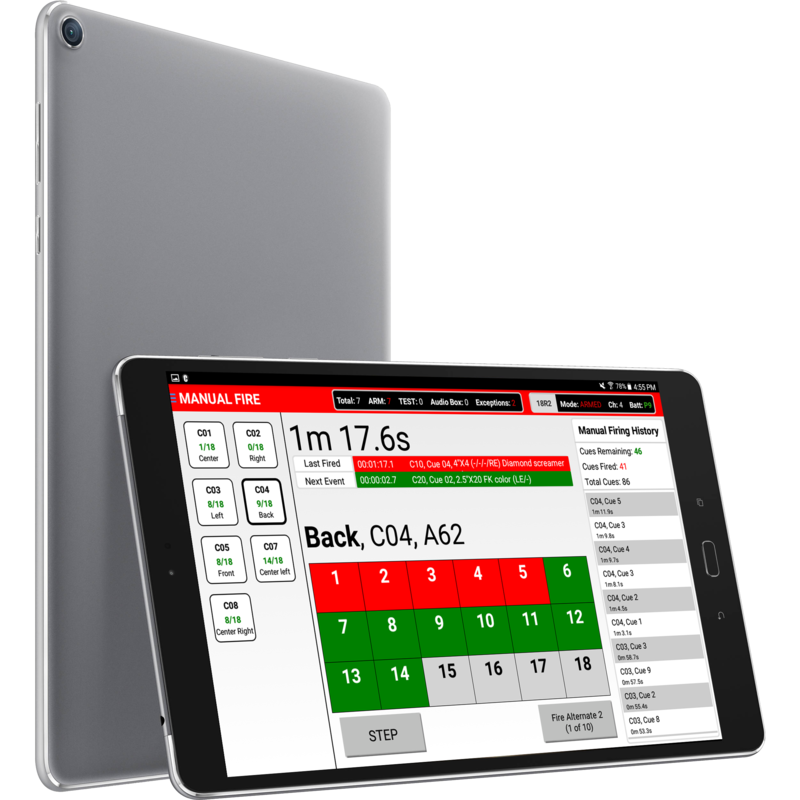 For any other specific questions on tablets, please be sure to reach out to us at jrobinson@cobrafiringsystems.com. Control Panel 2.0.4 BETA Update! 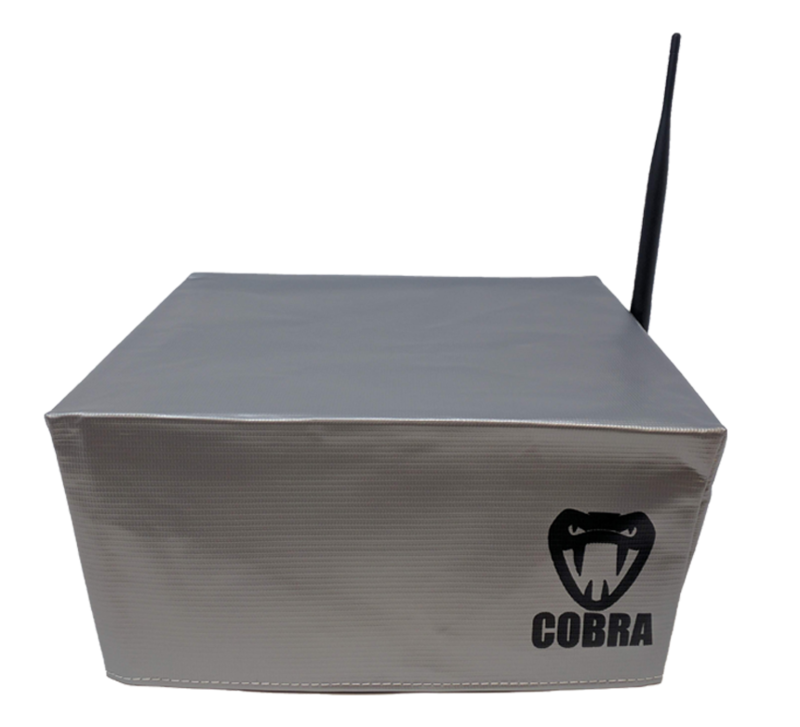 The COBRA 2.0.4 BETA release is a minor patch release for the COBRA firmware version 5.0.0 and 5.0.2. Added support for the Samsung View 18.4"
In an effort to help customers better understand our cables and their genders, we have recently adding clarifying drawings to all slat cables. 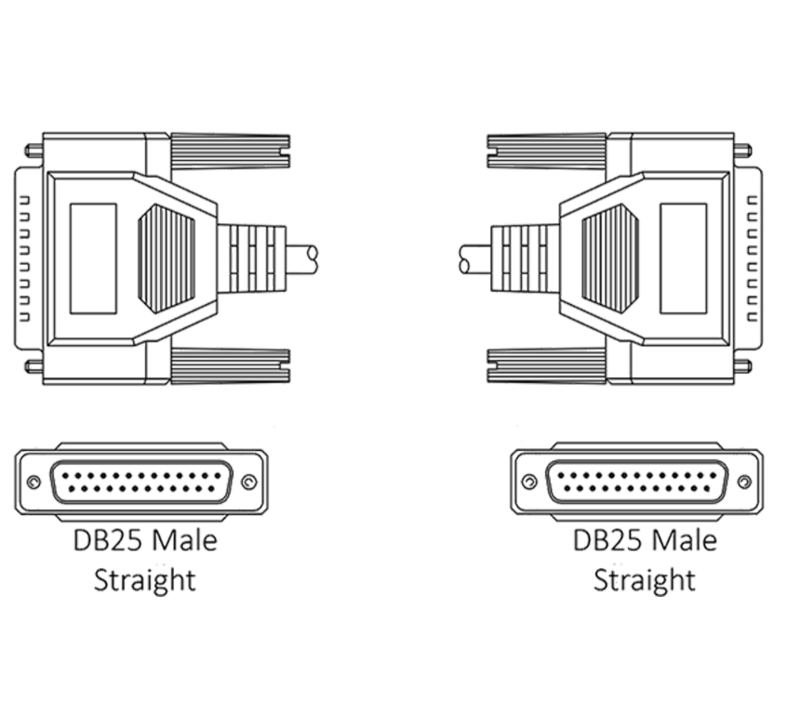 You can view these on our DB25 Cables page. We are excited to announce that we now offer a 6M Talon Igniter Clip . We heard your feedback and decided to have this COBRA exclusive length produced. Other than the extra meter of length, this size is identical to other talons we offer, and will function exactly the same. COBRA Baseball Hat Now Available! This is Betty, our office model. Betty looks fly in her COBRA hat. Be like Betty. We are thrilled to announce that the COBRA Baseball Hat is now available for purchase! 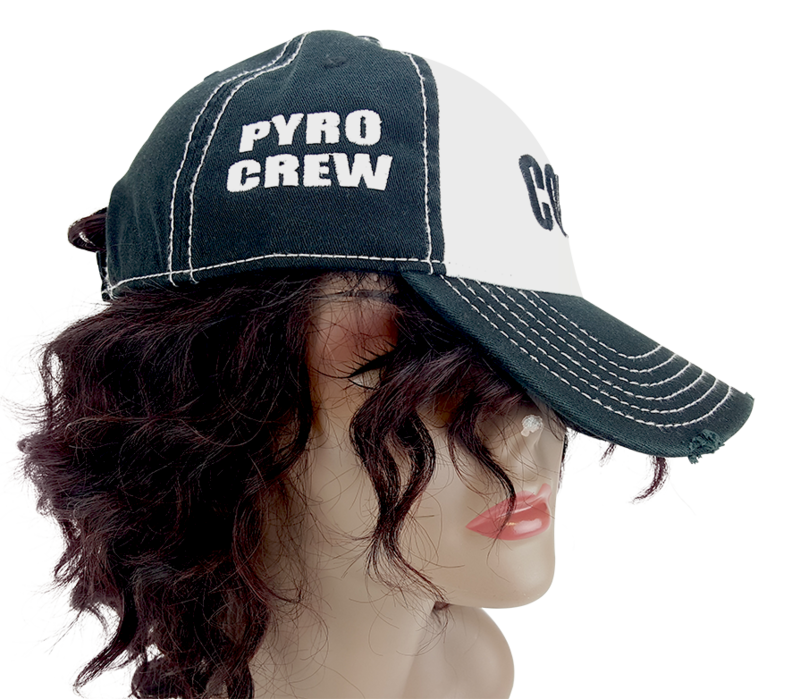 Boasting an adjustable velcro strap, pre-frayed brim, as well as a fabric back, this hat will be the envy of the shoot site. 18M Airburst Cue Strip Now Available! We are excited to announce that we have just released our RJ11 Airburst Cue Strip! This cue strip is designed to allow your module to fire Airbursts. Airbursts typically come as a set of three effects, pre-wired into an RJ11 harness. 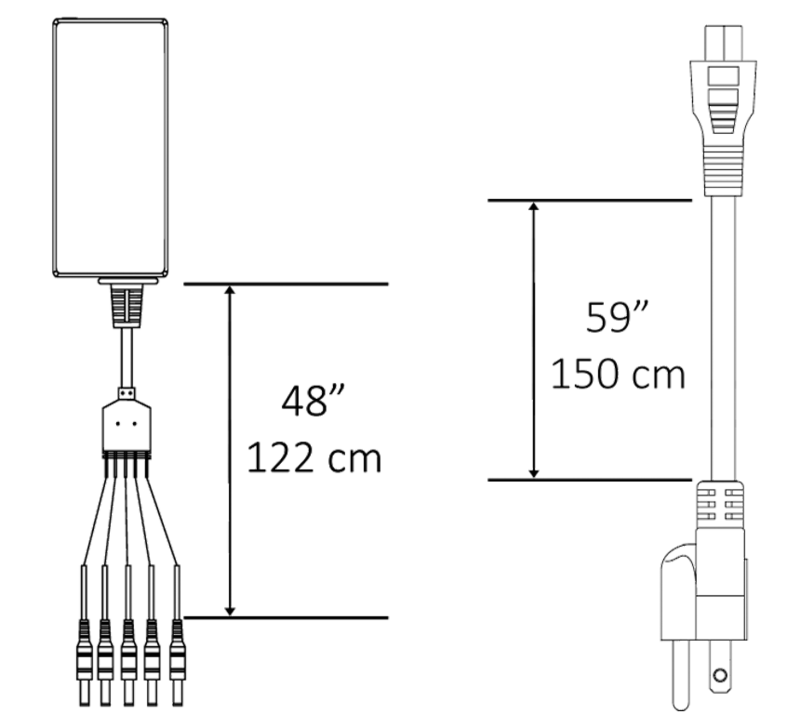 Each kit includes one cue strip with two separate RJ11 female connectors. You can install one or more cue strips per module. If you are using a Slat Connector, you will only be able to install these cue strips in the first and second bays. Installation is simple, only a screwdriver is required. We have been hard at work in the COBRA Art Lab creating a second series of our decals we know you have all come to love. You can find them along with COBRA apparel on our Stickers / COBRA Swag page. We have officially released the 36M firing module for sale and immediate shipment! One of the benefits of the 36M is it's ability to use varying Pro-Adapt plates to support different connection methods. We will be offering a number of options in the coming months. For our initial rollout, we are focusing on the large armored case with on board speaker terminals, and a version that supports 2 x 18S slats or a single 36 cue slat. We plan to release this 36 cue slat soon. Other options will include a side exit SE-300 case, quick plug support, mini 6 cue slats including CAT-5 cable support, and more. Any 36M can use a different Pro-Adapt plate by simply removing the plate and plugging in another. The 36M comes with a standard LiPo, external power and still supports 9V batteries in a pinch. 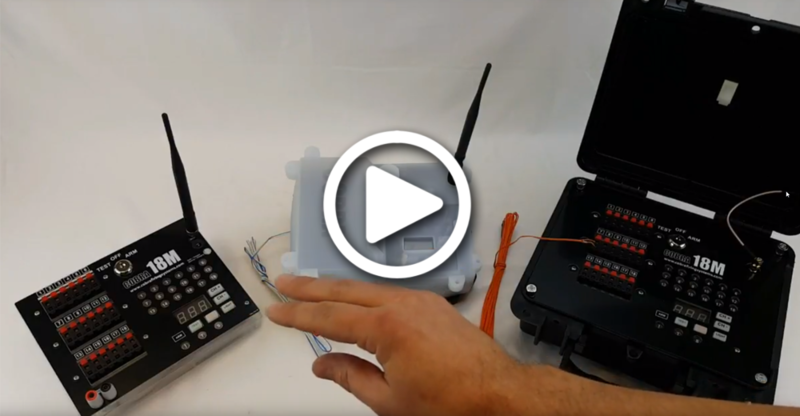 In addition, we have added an LCD screen for displaying channel, address, battery levels, signal and more without having to rely on a boot up process. We will be offering $50 off for the next week for each type of module with limited availability. Please note that the 5.0.2 firmware is required for operation. If you have any questions, please call at 518-222-7410 or email ssmith@cobrafiringsystems.com We plan to release a 72M option in the coming months as we are finalizing some of the adapter plate productions. We have performed another round of adding new replacement parts for modules, remotes, and more. You can browse all parts on our new Replacement Parts category page. We plan to continue adding more parts in the weeks to come. We also have included a list of parts added below. We are happy to announce we have added replacement parts for modules, remotes, and more to our site. You can browse all parts on our new Replacement Parts category page. We plan to continue adding more parts in the weeks to come. We also have included a list of parts offered below. Internal Antenna Cable Audio Box new! USB Port and Harness new! AC Adapter for COBRA 2.5W Booster new! Module Bottom Foam Boot new! Internal Antenna Cable for 18M new! Face Plate for 18R2 new! Face Plate for 18R new! Internal Antenna Cable for 18R new!